A chill is in the air, snow is on the way, and soon the slopes (or lodges) will be calling your name! With so many wonderful options, it might be difficult to choose! 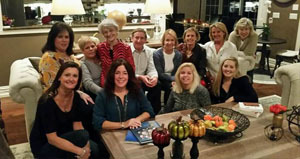 Not to worry, one of our expert consultants, Marylyn McLaughlin, happens to be a seasoned skier and long-time patron of many of these resorts. She shared her thoughts on one ski town in particular, Beaver Creek, Colorado. “I have been to and enjoyed many of the U.S. ski resorts with my husband and our four boys, but one resort has truly stood out to us above all others. Beaver Creek is a classic self-contained village equipped with a world-class ski mountain, 5 star resort hotels, an ice skating rink, high end resort shopping, art galleries, and an award winning performing arts center. It is not as big as some of the other top resort towns, but it proves that quality means so much more than quantity! The skiing on Beaver Creek is phenomenal for all levels of skiers. The more experienced and daring skiers (aka, my four sons) tackle the Birds of Prey, a lineup of double blacks that would challenge even the heartiest of risk takers. They are steep, deep, and bumped up. For those who prefer a calmer ride, there is plenty of terrain for cruising the blues, meandering the greens, and bopping in and out of the glades. All areas of the mountain are easily accessible with up-to-date, well-run. The trails are thrilling and offer beautiful vistas of the Vail valley. The food on this mountain is exceptional, and the service is just as impressive. After only two days at the hotel, the bartenders knew my husband’s “scotch”, my “wine”, and how many cherries to put into each of our kids’ customized “Roy Rogers”! There is a variety of exceptional places to eat, including Toscanini for Italian, The Blue Moose for pizza, the Coyote Cafe for Mexican, and The Dusty Boot for burgers and wonderful western ambience. Late in the afternoon, you will find scores of families gathered around the Hyatt’s large fire pit, roasting complimentary s’mores. 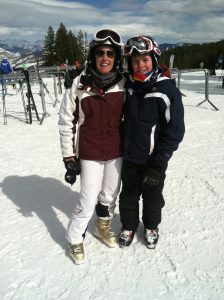 Photos courtesy of Park Hyatt and Marylyn McLaughlin (pictured with her son after a day on the slopes).